The tactical squad is the backbone of the Space Marine Legions, and the force by which the Great Crusade has re-conquered much of the galaxy. Thousands of these heavily armed and armored superhuman warriors, trained for battle in the harshest of environments and the deadliest of war zones, have crushed the enemies of Mankind time and time again. The tactical squad is a flexible combat unit able to attack or defend at will. The tactical squad can assault heavily fortified positions, hold and defend strategic objectives, or slaughter an enemy completely with little challenge. Before we look at the options, we need to note that the Legion Tactical Squad has a special rule called Fury of the Legion. Basically, it means that as long as there are at least five guys in the squad armed with bolters or bolt pistols can fire twice during the Shooting phase so long as they did not move, arrive via Deep Strike, or disembark from a vehicle during earlier in the turn. The down side is that they can’t Overwatch the turn the use Fury of the Legion, and they can’t shoot next turn. Add an additional 10 men This is an option that can go either way. You won’t really find a transport for them, but with 20 marines walking, they’ll probably reach whatever they want. Replace bolter for Combat Knife or Chainsword Not worth it even if it’s free. Take an Combat Knife or Chainsword This option cost points, but is the way I would go. However, you really mainly want these guys shooting. Nuncio-vox Nice little piece of equipment. It gives you basically a teleporting homer, and barrage weapons can draw line of sight from the unit with one. I would take one. Legion Vexilla Another handy piece of equipment that allows you to re-roll failed Moral test. I would strongly consider taking one. The sergeant can replace his bolter with one of the following. Combi-weapon Very good choices to take since you don’t really give up your bolter, but you do gain a special weapon. Plasma pistol I’m in the camp that Plasma pistols are not that great. Heavy Chainsword Why take this when you can keep your bolter and get a regular chainsword for 2 points? Not worth it. Power weapon A possibility, but I would still rely more on the Fury of the Legion special rule to chew up a squad before assaulting it. Power fist A viable option considering just about every person that can issue and except challenges, including sergeants, in this book can have a 2+ armor save. Single lightning claw Given the points and the fact you lose your bolter for it, I wouldn’t take this. Artificer armor It’s cheap, and you’ll probably see everyone else’s sergeant with it. I would suggest taking it if you have points. Whether you use a 10 or 20-man squad, the builds for this unit are limited but straightforward. Most of the builds will be broken down between how the sergeant is decked out and whether or not to give everybody in the squad a close combat weapon. Legion Tactical squad, Sergeant with chainsword and artificer armor, and Nuncio-vox. A basic build that resembles how tactical squad are generally run in normal 40k. For a 10-man squad, this build comes out to 172 points. If you add ten more guys, it will be 20 points more expensive. Legion Tactical squad, sergeant with artificer armor, Legion Vexilla, Nuncio-vox, squad armed with close combat weapons. This build is loosely based on the Space Wolves Grey Hunter squad. They’ll do well in the shooting phase, and they’ll stand their own in close combat in the assault phase. The Legion Vexilla is added to allow you to keep this squad in close combat or moving and shooting. For a ten-man team this build comes in at 210 points. Legion Tactical squad; sergeant with power fist, combi-weapon, and artificer armor, Nuncio-vox, Legion Vexilla, squad armed with close combat weapons. This build is meant to be a bit more rugged and get into fights. This unit would do well in the middle of your army not necessarily leading the charge but helping support some of your elite units. If there were a piece of equipment you could go without, it would be the Nuncio-vox. The Legion Tactical Squad is a tactical squad. I personally don’t like to bedazzle my tactical squads. For me, these guys are grunts; however, it’s going to be these guys that win you a game. It’s best to give them just enough war gear to make them durable, effective, and deadly. You’ll probably get more mileage out of them if you keep all the options and toys down to a minimum. Similar in design to many other Imperial units the Rapier carriers are semi-automated weapon carriers that are used where larger heavy vehicles may not be able to go. Designed to support weaponry to large and cumbersome for even Astartes, the Rapier’s relatively small size and mobility makes it a perfect support weapon. The most common armaments mounted on the Rapiers are the quad-heavy bolters or Laser Destroyers used for ant-personal and anti-armor respectively. The more unusual load outs such as the “Thudd Gun” and Graviton cannon also find us on the battlefield. Graviton Gun I’ll be honest. I’m not a big fan of the Graviton Gun, but if you want a Graviton gun in your army, this is the better way to get it. It’s best that if you take three of these for a single choice all three weapons batteries should be carrying the same gun. 3 Rapier Weapons Batteries armed with Laser Destroyer. For 165 points, this option is a nice and relatively cheap anti-armor choice. Because of it’s size and the fact that it’ll probably be in the back field, this option shouldn’t draw as much fire as a normal tank would, and even if it is destroyed, it’s still cheaper than a tank would have been. 3 Rapier Weapons Batteries with Thudd Guns. Personally, this would just be an absolute fun option to play with, and very fluffy for those who are looking to play Iron Hands, Iron Warriors, or Imperial Fists. All that aside, this option is also very good at handling the large blobs of twenty man strong tactical squad that are likely to be walking across the board. The nice things about these little fellows are that you can bring a fire amount of firepower without using a heavy support choice and at a cheaper cost. The draw back to this is that they don’t have the mobility that a tank would give you. It’s probably best to think of the Rapier is a kin to the Thunderfire cannon. You’ll want to set them up in terrain somewhere in the backfield and not move them after they are deployed. The roles are self-explanatory based on what gun you take: heavy bolter or quad mortar for anti-infantry and Laser Destroyer or Graviton Gun for anti-armor. In my book, the quad mortar or Laser Destroyer are the best options to pick. With the Laser Destroyer you would get three shots with the Ordnance special rule. The quad mortar would give you 12 STR 5 small blast templates that cause infantry units to have to take a pinning test. The Rapier is a great choice given its points cost. The draw back is that it’s an Elite choice, so you’ll want to make those points count. Still, it’s another option to bring yet more heavy weapons onto the field to be used to either support or in conjunction with Heavy Support choices. Points for points the Rapier will be cheaper than many of the Heavy Support choices and will probably be just as lethal. The apothecary is the Legion most trusted and scared members. It falls on their shoulders to tend to the wounded and fallen, but also tend to the continued health and future of the legion. It is the Apothecary’s duty to be a battlefield healer: tending to the wounded, returning the injured back to the fray, and if necessary, delivering final mercy to those beyond help. From those that are beyond help, the Apothecary has the onerous duty of recovering the Legion’s gene-seed for implantation in future generation of Astartes. There aren’t actually that many builds for this guy. The strength of the Apothecary comes from the fact that he increases the survivability of the squad that he’s in. That means that the Apothecary should either be taken bare bones or given only one or two of the above options. The difference between current codex Apothecaries and the Legion Apothecary is that, much like the Blood Angels, you can take three as a single choice. However, (this is a big point) they must be assigned to a set list of squads and can’t voluntarily leave it. Ultimately, it comes down to what squad you want to have the Feel No Pain special rule and then kitting him out to better work with the squad. Given how Feel No Pain works now it 6th edition, it is a nice thing to have an Apothecary or two floating around; however, for the most part, the legion Apothecary can only be assigned to troop choices. This is not a bad thing in of itself, but when coupled with the fact that most of the troop choices that the Apothecary can be attached to can also be twenty man strong, the purpose of the Apothecary seems negligible. Add to that that the Apothecary detachment is an elite choice, and you’re left with a unit that will probably only be taken because of fluff or personal taste. Again I find myself lagging in keeping this tactica updated on a regular basis. It’s been a wild couple of months. Between kids’ birthday parties, beginning to do yard work, and actually working on the miniatures that I love to write about, it’s hard to find the time to maintain the blog. However, I will continue, so none of you have to worry about things going anywhere. The Legion Techmarine is a vital member of any of the Astartes Legion and their Expeditionary Force. These Astartes demonstrate from an early stage an aptitude and intelligence for machinery that mark them for induction into the rites and secrets of the Mechanicum. It is because of this that Techmarines have dual loyalties to his legion and the Mechanicum. 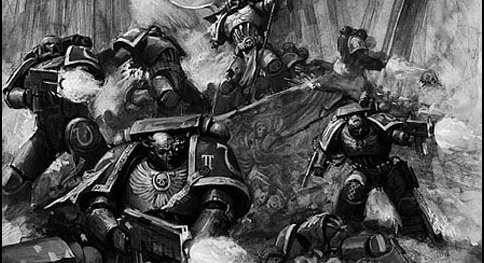 It is the responsibility of Techmarines to maintain the production and flow of war gear for the legion while personally providing repairs and construction service for the legion’s more specialized pieces of equipment. Legion commander deploy Techmarine to the front lines of combat to make sure that key pieces of war gear remain operational until the end of a campaign. Thunder Hammer A must. 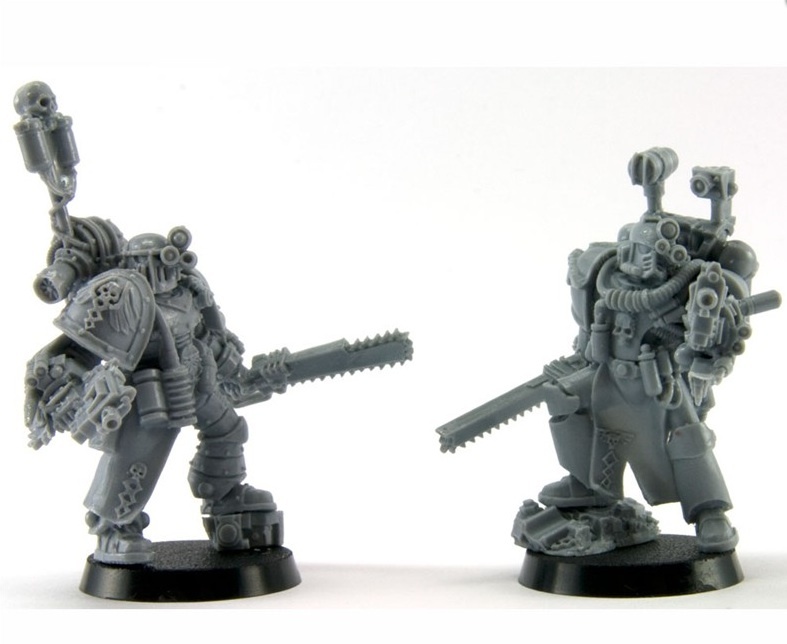 The Techmarine comes with a power ax. If you’re going to be going last in combat, might as well have x2 Strength behind you. Servo-automata Lascutter The cheapest Close Combat option. If you want to upgrade them take this. I have always found it hard to justify taking a Techmarine. There just are so many better options that I could spend the points on. This holds true for the Legion Techmarine; however, there are two points going for the Legion Techmarine of the standard Codex Techmarine: he’s cheap and you can take 3 for one choice. Even with those two points there are only a few load outs for him. 3 Techmarines, Rad grenades, Thunder hammer, Nuncio-vox. This build comes to 250 points. As I said, it’s a bit pricy for my taste. However, this build is mainly meant to ride around in transports and keep the transport alive. The weapons are there to help whatever squad is disembarking from the transport. You could spend a few extra points and give an Augury scanner, or substitute the Nuncio-vox for it. If you take the Augury scanner you would probably want him walking, so him and his squad can fire at whatever is Deep Striking. It goes without saying that if he were walking you would want to tack on the Cyber-familiar too. 3 Techmarines with 4 Servo automata, Rad grenades, Thunder hammer, Nuncio-vox, Augury Scanner, and Cyber-familiar. Servo automatas are upgraded to have Lascutters and two Rotor cannons. This is the full package build and should be clear the most expensive way to build this guy. This build doesn’t lend itself to join squads very well either, so the three Techmarines will be in their own Rhinos cruising around the battlefield looking for things that need to be repaired. They have enough shooting to soften up a target, and decent AP values and strengths for any close combat that may happen. However, as I said earlier, if you Techmarine is getting assaulted or looks like he will get assaulted, you’ve done something wrong. The Techmarine is not one of the better units available in the book. Most vehicles are strong enough to survive on their own, so taking a Techmarine is just for insurance. It takes up a valuable Elite choice slot that could be used for Terminators, Dreadnoughts, or other better choices. I’m sure there are some people out there that take a Techmarine all the time, but for me, I just don’t see it. Things have been a bit hectic around here. I’ve been making regular appearances at my local gaming store, working hard on two new armies, and trying to find a job while maintaining my health. However, things have settled into somewhat of a pattern, and I can return to working on the blog. I hope to have a few people helping out in the next month or so to give a wider perspective on the hobby and local community. Without further ado, let us dive back into the Horus Heresy book. 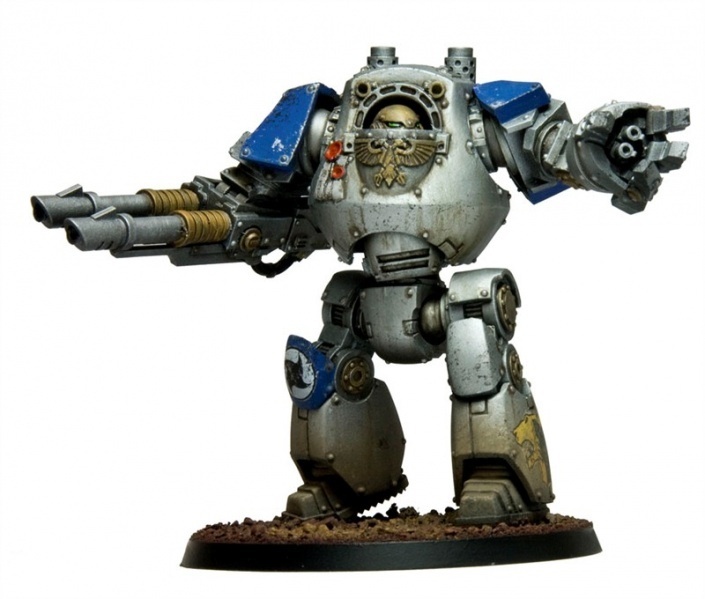 The Contemptor pattern dreadnought is a recent addition the Astartes Legion’s arsenal. It is considered the most advanced and most powerful dreadnought that a legion can field. Not only does it incorporate standard dreadnought technologies but also arcane technology that is drawn from the ancient and guarded lore of the Mechanicum. Among these arcane technology is the micro arc reactor that powers the dreadnought. This forgotten power plant is more powerful by far than anything of its size and bestows the Contemptor better speed, strength, and power for defensive energy fields. However, this power comes with a cost. The Contemptor requires more maintenance than standard dreadnought patterns, and if the reactor is breached, it spells catastrophic disaster for the dreadnought and its heroic pilot. Still, the power of the Contemptor has found it a place in every Legion, and the demand for the new chassis is high. To sum things up quickly, the Contemptor dreadnought is awesome. Maybe even overpowered, but hey, that’s all right. In my personal opinion, this is what a regular dreadnought should be. It’s WS and BS 5, strength 7, two attacks, armor 13, 4++ invulnerable save, and fleet. Twin linked Autocannon A good option for mid range support. It’s good for taking out light armor and troops. Plasma Cannon Great multi purpose weapon. You have 3 hull points so Gets Hot rolls shouldn’t be too much of a worry. Kheres Pattern assault cannon A six shot assault cannon. Great fun will be had chewing up troops with this gun. Heavy Conversion Beamer Too expensive with a big draw back: you can’t move and shoot. Second close combat weapon A must take if your charging your dreadnought into troops. Chain fist with in built twin linked bolter I don’t really see the point in taking this. Plasma Cannon Take this coupled with a Plasma Cannon on the other arm if you want to delete units. Kheres Pattern assault cannon Again, take two and chew up units. Personal note, this seems like it would be an absolute fun load out. Heavy Flamer The tried and true option for assault dreadnoughts that have two close combat weapons. Plasma blaster A better option for assault dreadnoughts that want to take on heavy infantry but too expensive. Melta Gun Take if you want a more “Ironclad” dreadnought, but a cheap weapon upgrade for assault dreadnoughts that want to take on heavy infantry. May take extra armor Coupled with the armor value and invulnerable save this could make the dreadnought almost unstoppable. May take a carapace mounted Havoc launcher It’s 15 points, but I would almost always take one. Even though the Contemptor is a powerful and great dreadnought, there are not a lot of builds for it. There are really only three builds that I see viable. Two close combat weapons, Havoc launcher, and dual heavy flamers. This build relies heavily on the Contemptor dreadnought having the fleet special rule. The idea behind this build is to close as quickly as possible with units and engage them in close combat. The heavy flamer and Havoc launcher are to really only there to soften up a unit before the dreadnought charges into combat. For a significant price increase, dual Plasma Blasters can be used on an assault Contemptor if you want to target heavy infantry. Close combat weapon with built in Plasma Blaster, Havoc launcher, and heavy weapon of choice. This build is meant to be a close support for your troops as they move forward. It has a variety of options to help deal with a wide range of treats that may come up. The heavy weapon would depend on what unit the dreadnought will link with as well as the type of army you may be facing. Take a Lascannon or multi-melta if you think you’ll face a mech army, or take an autocannon or Kheres pattern assault cannon if you think you’ll face a lot of troops. Dual heavy weapons and Havoc launcher. This build is based on the Dakka dreadnought. However, the Contemptor has a bit more options when it comes to weapons load out. You have dual twin linked lascannons if you want to hunt tanks. You have dual plasma cannons if you want to hunt light tanks and heavy infantry. Finally, you have dual Kheres pattern assault cannons if you want to hunt troops. The Havoc launcher is an option that can be dropped or added based on player preference, but the idea of it is that you have one more weapon to shoot. The Contemptor is a powerful dreadnought that every army will probably have at lest one of. Like the regular dreadnought it has the capability to fill a number of roles, but unlike the regular dreadnought, players should see better results with it. Terminator armor, the fruits of the Tactical Dreadnought Armor project, is a powerful and priceless addition to a legions arsenal. Impervious to all but the heaviest of enemy fire, legion veterans are able to march into the heart of an enemy force and destroy it with ruthless power. A terminator squad is a terminator squad. We all know how good a strong a terminator squad can be. 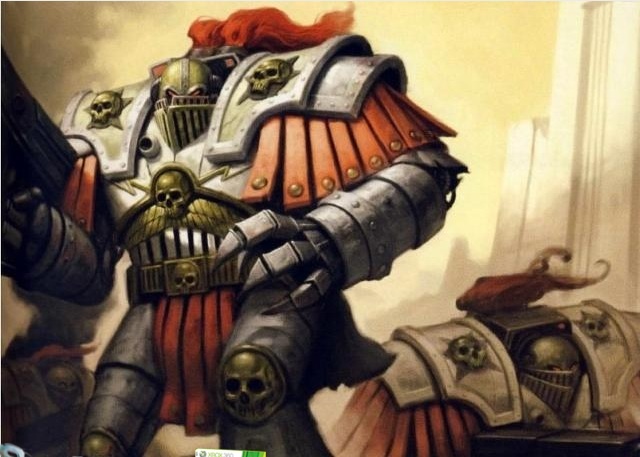 Sadly, legion terminator cannot be built into the god unit of 6th edition, thunder hammer/ storm shield terminators. However, we will look at what good builds are available. 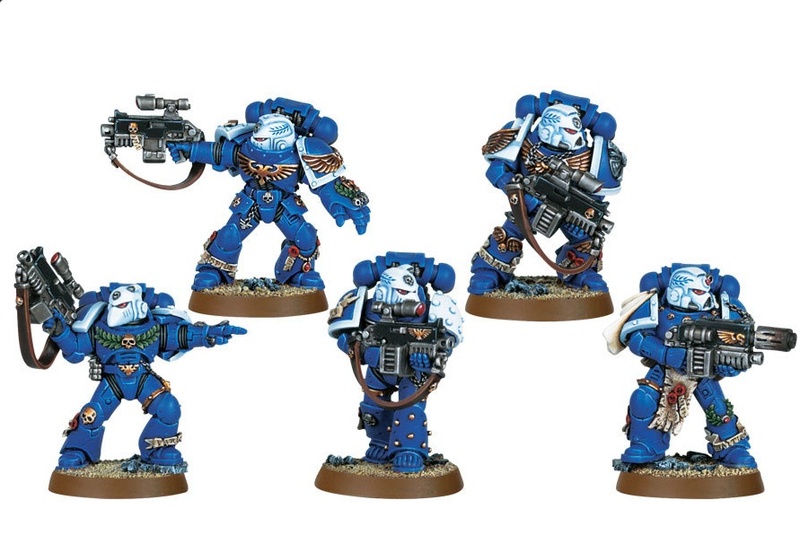 The terminator squad comes with 5 men with combi-bolter and power weapon. They have two nice rules: Implacable Advance, which makes them scoring units in mission where Troops are scoring units, and Prototype Weaponry, which allows them to have the legion specific weapons. Take an additional 5 men Depends on the points you have. Generally, the basic 5 guys will get the job done. Plasma Blaster My personal pick for this squad. If you ask five people how to load out a squad of terminators, you’ll probably get five different answers. We all have our favorite combination of weapons for terminators. However, there are a couple of key points to remember about a legion terminator squad. First, they can’t Deep Strike unless the mission, legion rule, or warlord trait says they can. Second, you can not have the thunder hammer/ storm shield build, so that will probably throw a monkey wrench in how some people generally play terminators. With that in mind, we have to remind ourselves what terminators generally do. For the most part they either have a powerful HQ choice with them, or they roam around the board rolling over squads. I should also point out that the squad does need a Land Raider transport. This increases their survivability as well as gets them to where you need and want them. Finally with those points at the forefront of our minds like look at some builds. 5 man squad, sergeant with grenade harness, power fists, Plasma blaster, Cataphractii armor – My all-purpose squad. It rides around in its Land Raider jumping out here and there to take out a unit. With the Plasma blaster, you have the ability to take a couple of pop shots at a vehicle, or threaten anything with a 2+ armor value. Up the squad to 10 man to get another Plasma blaster. 5 man squad, sergeant with grenade harness and power fist, Heavy flamer, Volkite chargers, and Cataphractii armor – This build is mainly used to go after Troop choices or run in to claim and hold an objective. Volkite chargers allow for additional attacks for every un-saved wound, and you don’t have to worry about the one time use of the combi-weapon. As with the previous build, you can add five more guys to get another heavy flamer or plasma blaster. Lightning claws can be used in place of the standard power weapons if you are worried about wounding. 10 man squad, sergeant with grenade harness, Cataphractii armor, and twin lightning claws – The good old vanilla assault terminator squad. 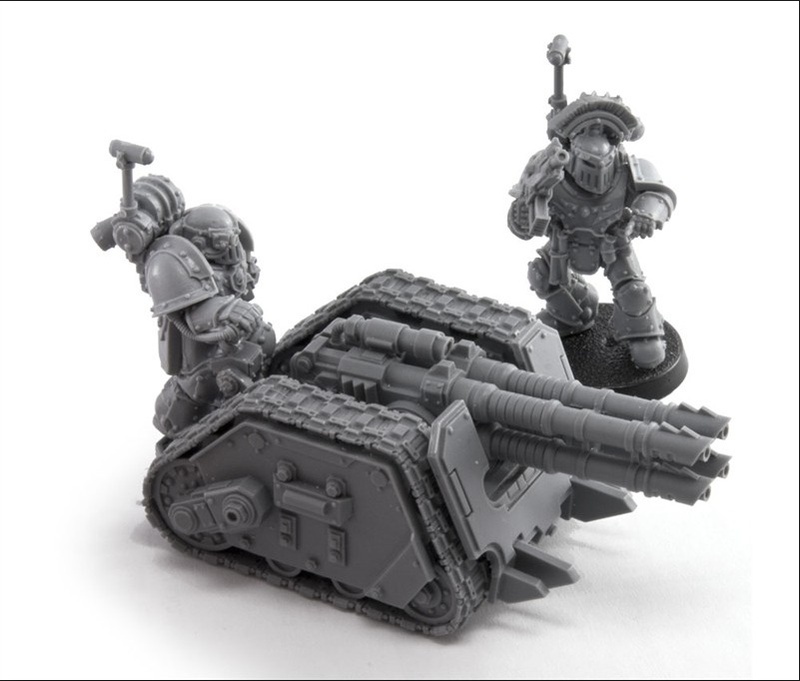 You can have them charge out of a Land Raider and watch them go all Wolverine on a squad. You get a bonus for two close combat weapons and you get to strike at your initiative. The reason for a full ten man squad is the possibility of running into someone with a 2+ armor value. With 40 attacks coming, a failed armor save will come up. The moment I said terminator squad most of you went into autopilot and figured out your favorite build, and I congratulate you for that. As you have probably seen I did not figure in a particular HQ choice with these squads as I personally would take a Legion Command Squad if I took a Legion Praetor or put the Legion Centurion a completely different squad depending on what consul I gave him. I personally see terminator like I see tactical squads. Don’t over complicate them. They’re a good solid unit that will get the job done. The Legion Destroyer squad found its origins during the Unification Wars that wrecked Terra before the Great Crusade, but it but not with Imperial force but with the enemy. Most legions consider the squad and its use as dishonorable and eschew it use. The Destroyer squad is home to troublemakers, outcasts, and Astartes that the legion would like to forget about. Adding to this stigma, the squad uses dark and forbidden technology like Rad-weapons, bio-alchemic, and the clawing burning horror of the Phospex. I see these squads as a mix between biochemical/nuclear infinity and insurgents, but neither this nor the fluff described in the book really translate well in terms of game play and option builds. In short, the Legion Destroyer squad is an assault squad with a little bit better shooting ability. As you can see, they are pretty much just what I said they were. Assault marines with a bit more shooting. They don’t have much going in the way of special rules except Counter-Attack, which is nice. To begin with, I’ve never been thrilled with the performance of Assault Marines, so I maybe a little jaded towards this unit. They have the same stats as a regular assault squad, the bonus for weapons, and the same for charging. Ultimately, things will be depended on what you want the squad to do. 10 man squad, Sergeant with Power Weapon and 3 Phosphex bombs, 2 Missile Launcher and Melta bombs. A relatively cheap build meant to move around and shoot up squads, and then move in to clean up the mess. The drawbacks of the unit would probably keep it to taking out Troop choices. It goes without saying that a Rhino would be a recommended purchase. For an additional 50 points you could get two missile launchers in this squad. 10 man squad with Jump Packs, Sergeant with Power Weapon, 3 Phosphex bombs, and Artificer armor. For those who are more inclined to use this unit for close combat here’s a build that shouldn’t disappoint. Your sergeant is built to survive a challenge while attacking at initiative step. If there looks to be anyone heading towards this squad with a 2+ armor, then chunk a Phosphex bomb at them. As for ranged weapons I would probably go with Plasma Pistols or Hand Flamers. Keep in mind that you can drop the Legion Centurion Moritat in the squad and bring a whole lot of hurt. 10 man squad with Jump Packs, 2 Missile Launchers, Melta bombs, Sergeant with Artificer armor; Power Fist; and3 Phosphex bombs. You have decided to completely flush points down the toilet for a squad built like this. It could probably jump around the board killing whatever it wants. Missiles firing AP 3 small blast templates. Melta bombs blowing up tanks or being slapped into the face of heavier troops. Sergeant with Power Fist and Phosphex bombs that can kill Terminators. Again, drop a Legion Centurion Moritat into this squad and the definition of pain will be changed. The Legion Destroyer squad is a strong unit on its own, but linking it with a Legion Centurion Moritat or Assault squad and it becomes even stronger. You can use this unit jet up the flank striking at units that are seperated from the main force, jet up the flank and attack units or objectives that are in the opponent’s deployment zone, or simply have them jumping around the board bullying units until your troops or heavier elites come in to clean things up. Another thing to keep in mind about this unit and any other that is reviewed in this tactica is that Legion specific rules are not being applied. I can only imagine how this or some of the other units will turn out when placed into a specific Legion. That alone has the possibility to change the dynamic of many units. My experience with Space Marine assault squads has been that of lackluster, so I’m still a bit leery. However, I’m sure this unit would change that perspective. The Legion Veteran Tactical Squad is where exceptional and experienced warriors will be found. They are awarded further training in all the various arts of war, and can look to one day be inducted into special warrior brotherhoods, martial cults, or specific veteran companies. They are the ones that all Astartes aspire to become, and they make up the pool of future commanders. So how does this epic level of martial ability and training translates into the game. Honestly, the Veteran Squad has the stats and wargear that I think all marines should have, but sadly Games Workshop never consulted me. When you look at it however, that is ultimately what this squad is: a tooled up Tactical Squad. Let’s jump in and see what me get and can do. Right out of the box these guys come with Power Armor, Bolter, Bolt Pistol, and Close combat weapon along with the special rule Veteran Tactics, which we will look over. The Veteran Tactics special rule allows you to choice one of the following Universal Special rules for the Legion Veteran squad: Fearless, Sniper, Furious Charge, Outflank, Tank Hunters. As I said before, this is a tooled up Tactical Squad, and the Veteran Tactics special rule makes them a bit better at a particular job. To put it simply, this unit is more likely better used to support you HQ choice or treated a bit like Sternguard, which is the reason for the picture. Yes, they may have 2 Attacks and 2 Close combat weapons, but I personally would not throw these guys willy-nilly into close combat. Out of the Universal Special rules you can get, there are only 3 that speak to me as fitting this squad and the best way to use this squad: Fearless, Sniper, and Outflank. Let’s talk business and get some builds out of these guys. Sergeant w/ Combi-weapon and Melta Bombs. 10 man squad. 2 Plasma guns. Special Rule Outflank or Sniper. The special weapons in this build could be switched with the Heavy Bolter or Missile Launcher. The point of this unit is simple, move to an objective and hold it. The Sniper rule is particularly nasty for this as you can get Precision Shots and Rending on Plasma guns, Heavy Bolter, and Missile shots. Sergeant w/ Power Weapon. 10 man squad. 2 power weapons. 2 Heavy Bolters. Special Rule: Fearless. This costs a bit more, but has an equally simple approach, move around the board and kill infantry units. I shouldn’t have to say that you probably won’t want to send this unit towards heavy infantry or even HQ units, but it should make short work of regular Troop Choices or Devastator like squads. Shoot the unit and then assault it and repeat. I’m sure there are many other builds that many of you will point out. However, given other units available in the Horus Heresy army list. I really only see this unit as a sold fire support unit that moves in and clears out objectives for friendly units to come in and claim. It is best to keep this guys cheap and simple. They will survive and kill in close combat, but it is best to have these guys shooting. Increasing the squad to a 10 man squad is a most since you will then be able to have 2 special weapons. It will then be best to give them a special veteran rule and weapons that will aid them in killing infantry and Troop choice units. 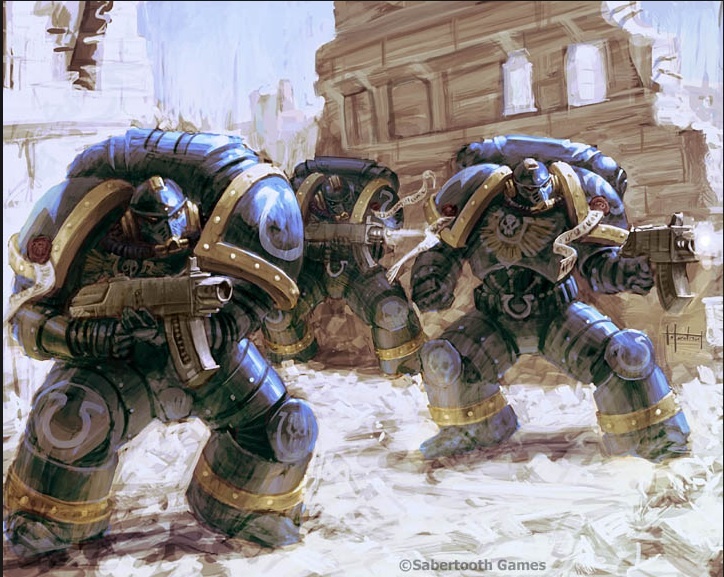 A Space Marine Legion is vast and complex entity that requires hundreds of battle-commanders and officers. This role is filled by the Legion Centurion. Centurions can range from a line lieutenant that is in charge of a special strike force to commanders that lord over the various offices of the legion. The Legion Centurion is a unique HQ choice. He covers some of the generic HQ choices such as Master of the Forge, Librarian, and Chaplin to more specialized units. He’s not particular a grand and sweeping command unit like the Legion Preator, but more of a surgical knife that is pick to do a particular job, and accompany a particular unit. Before getting into wargear options. a basic knowledge of the Centurion’s Consul will be needed since picking a particular Consul will determine what wargear options you will be allowed to take. “What are Consuls?” you ask. Well to put it simply, a Consul is to represent a particular office or type of commander the Centurion is. Let’s take a look at what they are. Chaplin – As the name suggests, this makes your Centurion a Chaplin, and gives the unit Fearless and Hatred rules. Master of Signal – A very interesting unit that will probably see a lot of play. This unit grants the Night Vision rule on himself and the unit. However, in lieu of him shooting he can select a unit within in 6” to have +1 to Ballistic Skill. He also allows units arriving via Deep Strike to not scatter if the land within 6” of him. Finally, barrage weapons may draw line of sight from him. Legion Champion – This is similar to the Emperor’s Champion and Command Squad Champion that is seen in most Space Marine armies. He has a Master Crafted close combat weapon, WS 6, and must re-roll failed attempts at Heroic Intervention. Vigilator – A captain version of a Scout. A fun thing you can do with him is sabotage enemy units and fortification before the game begins. Librarian – As the name suggests, you get a Librarian with this upgrade. It’s important to note that this is the only way to get a Psyker in your army beside a special character that may have the rule. The nice thing is that you can take up to 3 mastery levels, and choose powers from the Warhammer 40,000 Rulebook. Primus Medicae – A captain version of an Apothecary, but gives you a chance to recover Victory Points from the lose of any friendly units nearby. 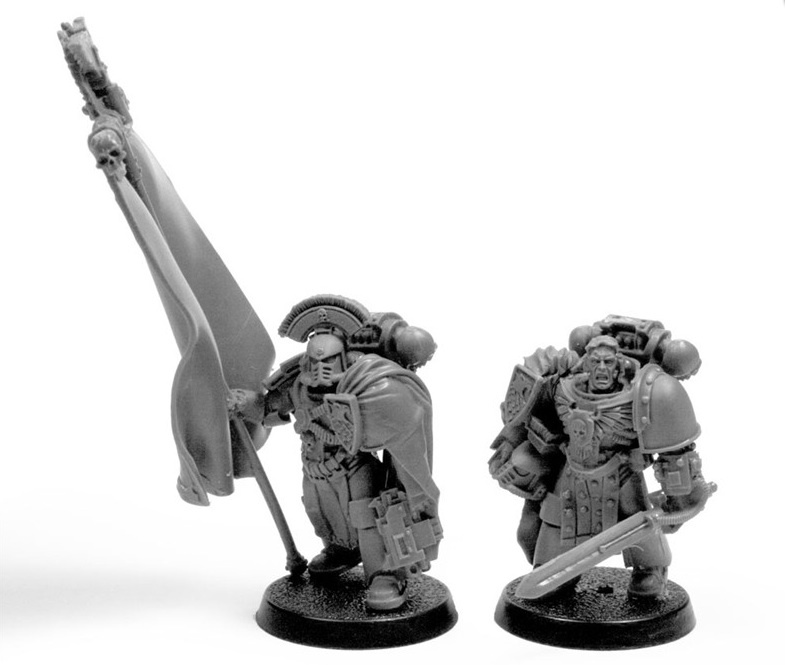 Forge Lord – A captain version of a Techmarine that has access to both the Centurion wargear options as well as the Techmarine wargear options. Siege Breaker – The title says it all. This unit has the Tank Hunter and Wrecker special rules, which allows him to re-roll failed To Pin rolls on fortification and immobile terrain as well as gaining a +1 on the Building Damage table. This is given to any heavy weapon unit he joins. Much like the Master of Signal, barrage weapons can draw line of sight from him. Finally, he can take up to 3 Phosphex bombs and allow Medusa Siege Tanks to have Phosphex shells. If it’s a building and it absolutely needed to come down yesterday, use this guy. Moritat – A special unit that is basically a coldblooded killer. He has an additional pistol and rad grenades that has the Counter-attack and Scout special rules. The nice part is the Chain Fire rule that allows him to make extra shots on any successful hits and continue until they miss. Keep in mind that this unit cannot be taken as a Compulsory HQ choice, and cannot join any unit but a Legion Destroyer squad. As you can see depending on the Consul choice you take certain wargear option becomes limited, and others lend themselves to being the best choice. It’s probably more effective to instead go over the best wargear option for the Consul choice. Chaplain – It’s best to outfit this guy like you would a normal chaplain. Give Artificer Armor if he is staying power armor and Refractor field to give him an invulnerable save. Give him a Jump Pack if he is going with Assault Marines or a bike with marines on bike. Finally, it goes without saying that if he’s with Terminators give him Terminator Armor. Master of Signal – He is limited in the wargear he can have. First and foremost, he can’t have a bolter or combi-weapon. Of course given his special rules, I imagine that you just stick him in a squad of Devastators and go from there. With that in mind, it’s best to keep him simple. Give him Artifice Armor for survivability, and a power weapon for any unit that happens to assault him and the squad he’s with. Legion Champion – This is one of the few choices where you are free to pick whatever wargear you want. You’re mainly paying the points for a WS 6 character, and his build depends on the unit you put him with. Keeping in mind that he probably won’t be able to take out Special Characters or the Legion Preator, it’s clear what options are best. Again, keeping things simple is the best approach. Give him Artificer Armor and a combat shield since you want him to get into close combat. Then take your close combat weapon of choice. It is a nice thing that you can put him in Terminator Armor. Vigilator – This choice is limited on wargear option. You can take Scout Armor for free to gain the Move Through Cover rule. Most of the basic close combat weapons are available. To be honest, this guy doesn’t speak to me. If I had to do a build, then I guess this is what I would do: Give him a power weapon, melta bombs, and a Refractor field. Librarian – A unit we are all familiar with, so have a good idea how to out fit. However, he has the option to take a power fist, thunder hammer, or lightning claw, which regular Librarians don’t have access to. Given that he can have up to three different powers it would be best to put him on a jet bike, so you can have a highly mobile unit that can sow hate and discontent all over the board. Give him Artificer Armor to increase survivability. Primus Medicae – Given his special rule to recover Victory Points you will want this guy mobile. Putting him on jet bike or giving him a jet pack is the way to go. Artificer Armor and Refractor shield is also highly recommended, as he will be a high value target for your opponent. 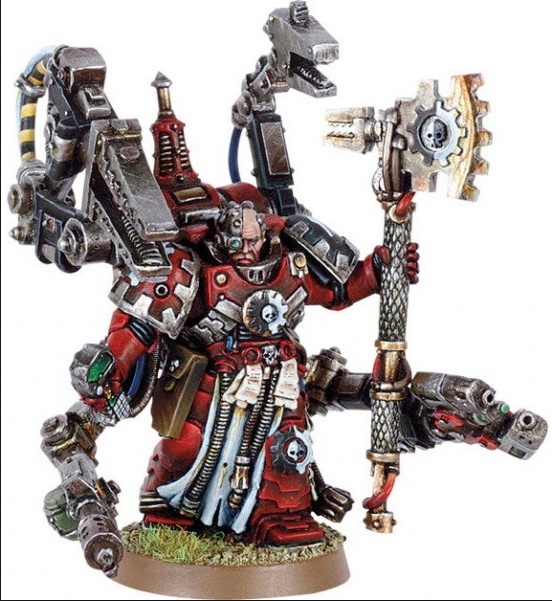 Forge Lord – Though it maybe tempting to have a Terminator Techmarine, it would make his Battlesmith special rule useless. I would keep him mobile by putting him on a bike or jet bike, and just let him shoot things with a graviton weapon or conversion beamer. Siege Breaker – With his special rules, it’s clear that you want to put this guy in a special weapon squad and go after tanks and fortifications. Keeping him simple and to the point is the way to go. You want to put in Artificer Armor since he’ll probably be riding around in a Rhino with his tank hunting buddies. Give him a combi-weapon to give him some range. When it comes to close combat I personally can see this guy with anything but a Thunder hammer, but it’s more cost effective to give him melta bombs and a power weapon. Moritat – To begin with, this guy sounds awesome and fun on paper, but does not work well in game. To start, he relies solely on pistols for any ranged attacks. Second, he can only be linked to a Legion Destroyer squad, which is a squad that relies solely on pistols for ranged combat. If I built one, I would give him Artificer Armor for survivability and Refractor shield, and then give him two plasma pistols. It’s best to think of the Legion Centurion as a support HQ choice. This unit works best when linked with another unit or with the Legion Preator. The Consul choice is also what will really determine the options and mission as well as if the Centurion is taken as your only HQ choice. The Centurion is a good choice because it will help to focus the tactics of the overall army. Is your army going for a more stand off approach and just shooting, then take the Siege Breaker or Master of Signal. Is your army more close combat oriented, then take a Legion Champion or even a Moritat. What job do you need the Centurion and you army to do and pick the Consul that would best help you achieve that goal. The Legion Praetor is the mightiest warrior of the Space Marine Legion. They are second only to the Primarchs themselves. These lords have immeasurable power at their fingertips and delivers life and death to millions of lives across hundreds of star systems. They are master strategists and fighters. In short they are the masters of the Space Marine Legion. Before we go too much further with this tactic, there are a few things to go over first. This tactic is only going to go over units of the Legion Astartes army list. Basically, I’m leaving out legion specific rules, units, and war gear for a later time. We’ll also have to go over the Legion Astartes special rules and warlord traits before going into the Praetor unit in depth. Finally, there’s Heresy-era war gear that I’ll go over as they are brought up in the option. Legion Astartes: Any unit with this labeling gets two rules tacked onto any other rules that may be associated with them. First, units with this label may always attempt to regroup regardless of casualties. From my understanding this is basically And They Shall Show No Fear, but with the disadvantage that units don’t automatically regrouping after falling back. However, it does give the option to regroup in situations that previously didn’t allow them. Though none come to mind. This label also opens the legion specific rules for a named legion. These traits are in addition to the universal Warlord Traits provided in the Warhammer 40,000 Rulebook. Just like the universal traits none of the traits scream over power, and there is no way to build your Praetor with a certain trait in mind. I’ll just go over them quickly. Master Tactician: Allows the player in control of the warlord to redeploy one unit after both armies are deployed but before the first turn. This means that one unit may be put into reserve or brought out of reserve. World Burner: Units nominated by the warlord on a D3 gain the Shred special rule to any template weapons they have. Paladin of Glory: The warlord is Fearless and friendly units within 6″ gain +1 to their Wound score at the end of the Assault Phase to see if they won. Void Walker: The warlord gains the Adamantine Will special rule, and an Infantry unit nominated by the warlord gains the Deep Strike rule. Child of Terra: The warlord and any friendly unit he joins may re-roll any 1 on To Wound roll during close combat. There is a set of additional traits called Rites of War that the Praetor can take in addition to his Warlord Trait. These traits are optional as they limit your army depending on what trait you take. I really only see these taken to create a themed or storied army during campaigns or Apocalypse games. However, like before I’ll go over them as quickly as I can, and leave out any editorials that I might have. Rite of War: Orbital Assault – Allows army to take Drop Pods in place of their Rhino Dedicated Transport, and Terminators gain the Deep Strike rule. The draw backs are that units that cannot deployed by Deep Strike because they lack the rule or they cannot substitute their Dedicated Transport cannot be chosen as well as fortifications can not be chosen. Rite of War: Armored Spearhead – Units can substitute their Rhino Dedicated Transport for a Land Raider and Tank Shock has a -1 leadership value. The drawbacks are all units must be deployed inside a tank, and if all tanks are destroyed the opposing player scores an additional secondary objective. Like before, fortification cannot be chosen. Rite of War: Angel’s Wrath – Units with jump packs gain the Hit and Run rule, and units that can take a Rhino can take a Storm Eagle instead. The drawbacks are only units with the Jump Infantry, Skimmer, and Jet bike rule as well as units being deployed inside a Skimmer or Flyer can be chosen, and no tanks or fortifications can be taken. 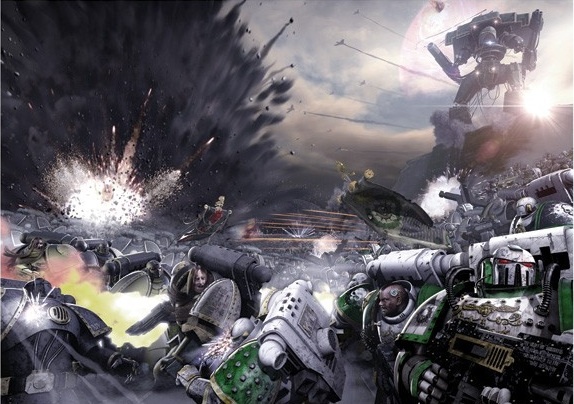 Rite of War: Pride of the Legion – Veterans and Terminators count as Troop choices and must be take as part the compulsory troop selection, and Command Squads my take Land Raiders. The drawbacks are if all Veterans and Terminators are killed then the opposing player scores a secondary objective, and allied forces cannot be taken. Paragon Blade A sword that gives +1 to STR and has AP 2, and causes Instant Death on Wound roll of 6. It’s not cheap, coming in at 25 points, and it’s a Specialists Weapon. This is probably what I would take. Grenade Harness They’re a one time use assault grenade for Terminators with an Assault 2 profile. This is a squad of 3 marines that are basically veterans. You can take up to an additional 2 more marines. Their equipment is a bit more rounded out with Bolter, Bolt pistol, and Close combat weapon. The squad also has a Legion Standard, which comes with the squad as part their equipment, and the standard gives the Fearless rule to all friendly units within 6″. Terminator or Cataphractii Armor I would go with Cataphractii armor. This guy is basically a Chapter Master with a few more rules that he can tack on, so I would outfit him like I would any Chapter Master. 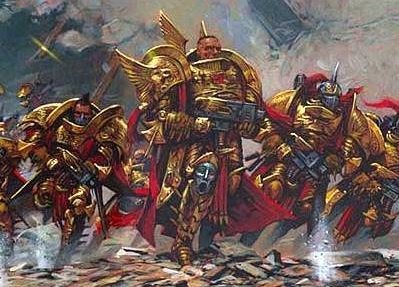 There is nothing in the Horus Heresy army list that would over power a regular codex game, but I personally would only play a legion army for the Horus Heresy campaign or other campaigns and Apocalypse. With those points in mind, there are a few ways we can build this guy. The Praetor’s stats are very strong and you’ll want to put him into combat and get him into the think of things, but he may not fair well against Special Characters and a Primarch. You’ll want to out fit him and put him into a squad with that in mind. This gives you a footslogging Praetor with a Bolt gun, Archaeotech pistol, Paragon blade, Digital Lasers and Iron Halo. If you have points put him in a 5 man Legion Command squad with power weapons and combat shields, which would add an additional 200 points. This is not counting and transports. This gives you the same thing as the Foot Slogging build had, but with a jump pack. This is one of the more pricey basic builds. Attach him to an Assault Squad with a command squad, and you have a very nasty unit that can clear out objectives for your troops to come in and claim. However, going off the points build so far, it’s clear a unit like this would be soaking up a lot of points. You read that right. It’s cheaper to put this guy in Terminator armor give him Digital Lasers and a Paragon blade than it is for the other builds. There is one caveat to this build. I did not factor in which suit of Terminator armor you would take. If you take standard Terminator armor then spend an extra 10 points to give him an Iron Halo. His only ranged options are a Combi-weapon or Volkite charger, both of which are 7 points. The benefit of this build is that you can leave the Command Squad, and just put the Praetor in with a regular Terminator squad.